Manvers Lake & Dearne Valley Trust Ltd is a registered charity and not for profit organisation. The Trust was formed in 2011 to look after Manvers Lake and the surrounding area, including managing the Boathouse and its facilities. We currently have 3 subsidiary businesses, Manvers Waterfront Boat Club Ltd which is a multi sports club, Manvers Lake & Dearne Valley Trading Ltd who carry out much of our maintenance works, and Manvers Lake & Dearne Valley Events Ltd who organise large sporting events. The waterfront development at the south side of the lake adjacent to Manvers Way was developed by Express Parks, who became TCN) Ltd. The freehold of the whole site is held by Rotherham MBC, Manvers Lake Trust and Avon Ground Rents Ltd. 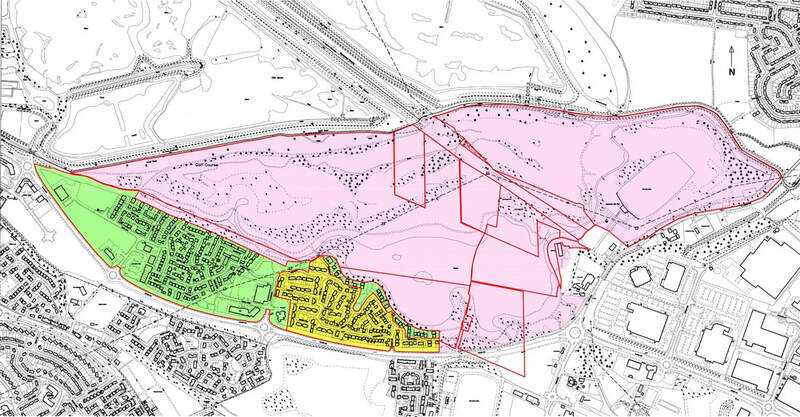 The plan below shows the freeholds, with Manvers Lake Trust in Green, Avon Ground Rents Ltd in Yellow and Rotherham MBC in Pink. 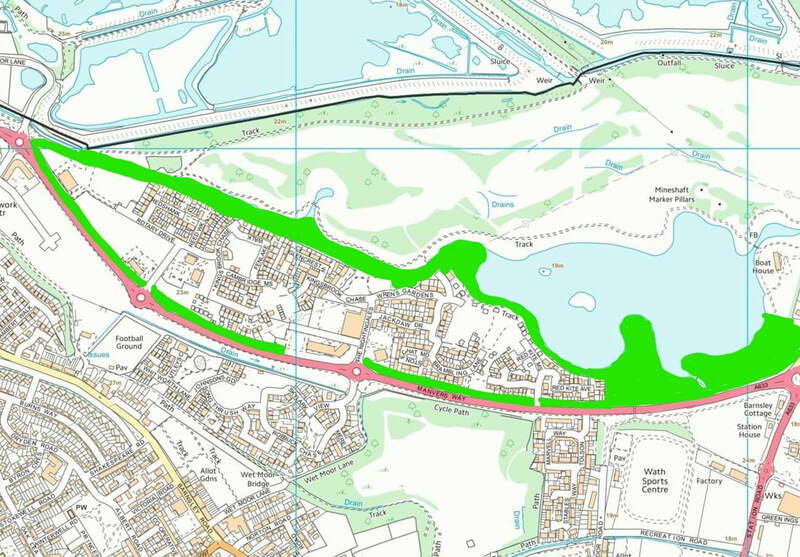 Rotherham MBC would not agree to maintain the country park to the south of the lake; therefore the costs would have to be met by the businesses occupying the future development.Each of the businesses has a lease containing a plan showing the parkland area to be maintained and the terms of the Estates Charge and what it covers. The area outlined by the heavy line on the plan below is the area maintained by the Estates Charge. When TCN had completed the development of the site and wanted to dispose of the head lease it was acquired in December 2015 by Manvers Lake & Dearne Valley Trust Ltd. This means that the Trust has to maintain the parkland in accordance with the lease terms. It also has to budget for the maintenance, invoice the businesses each quarter and produce audited accounts each year to show where the money was spent. There is provision to cover unexpected problems such as if a bridge was vandalised and needed immediate replacement, this can be charged to the Business Tenants as a one off charge. We aim to avoid this by building up a “sinking fund” with a small contribution from all each year as part of the Estates Charge to cover the one off events. The Trust only maintains areas of the estate that have not been leased to others. We maintain the two car parks which have our signage, much of the grass verge along Manvers Way, the lakeside to the south of the lake from the old Garden Centre to the housing development and the paths and embankments from the western end of the lake to the Old Moor Roundabout. Maintenance of the developments within the estate falls on the individual Landlords and their management companies. The drawing below shows the areas maintained by the Trust under the Estates Charge. The Trust has a wider responsibility to maintain other areas around the lake but these are not funded by the Estates Charge. The plan below gives an indication of the areas currently maintained by the Trust and funded by the Estates Charge. This is not to scale and is intended only to demonstrate the extent of the area maintained. Where the tenants of the Trust have sub tenants, generally in the housing developments, the Lease between the Landlord (housing developer) and the house occupier generally allows the Landlord to divide up the Estates Charge from the Trust and ask each house occupier to pay a proportion of this. They could also add in other charges for Insurance, invoicing fees, management etc which are not part of the Estates Charge from the Trust. If any house occupier were to buy the freehold of the property, the Estates Charge would still be payable. The Trust is happy to answer questions on the make up of the total Estates Charge Budget and Charges, and how this is applied to our direct tenants, but we cannot answer queries relating to sub tenants charges or how these are divided and applied. All sub tenant queries should be addressed to the business that issues the invoices to the sub tenant. In September 2017 the Trust held a meeting to which we invited all our direct tenants to share our proposed budget for 2018 and explain the reasons for a substantial increase. Many of our tenants attended but some chose not to do so. None of the sub tenants were invited as we have no direct relationship with them. The budget has been static for the past 2 years with only minor changes in the preceding years. This has been found to be inadequate and doesn’t allow the necessary works to be completed. When the old budgets were set the housing development wasn’t complete and now with the developments being complete and fully occupied the footfall around the site has increased. The site landscaping was new when the old budgets were set and now the trees and shrubs require considerably more maintenance works. We have more waste to remove including fly tipping (domestic waste dumped on site). The amount of managerial time required has increased as the site has developed and matured. The volume of queries that require us to seek advice from our legal advisors has increased. Some of our costs incurred were not being allocated to the Estate. We have received a number of requests from leaseholders to buy the freehold of their home and we have no objection in principle to this. However, leaseholders need to be aware that there is likely to be more than one leasehold interest in your property. Leaseholders should also be aware that after the purchase you would still be responsible for paying any Service Charge[s] to their current landlord and would have to pay an Estates Charge directly to the Trust to contribute to the maintenance of the wider area. We strongly advise you before you commit to any course of action to seek the advice of an independent solicitor. We do not want you to take any action that would make it harder for you to purchase your freehold or harder for us to collect the ongoing estate service charge, or allow any ongoing or future legal challenge to either your freehold purchase or the Service Charge as this would not be in the best interests of the area moving forward. When purchasing your freehold the Trust would like to receive a money offer and an assurance that our legal charges will be paid. The Charity’s objects are to maintain the lake and surrounding parkland in perpetuity for the people of Wath. As such we are a “Not for profit” organisation, but we do have an obligation to all to make the most of our assets and to manage the lake and surrounding park land to the standard expected.